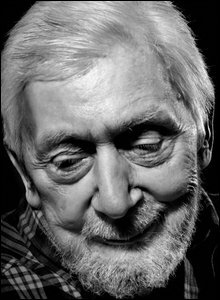 I was saddened last week to learn of the death of Edwin Morgan, the Scots Makar (the Scottish equivalent of the Poet Laureate, I suppose). I discovered Edwin Morgan when I was fifteen, and I went out-of-my-way to acquire his books; something I’d never done for any poet previous (though am happy to say I have done for many since). The themes of his poetry range from love, Scotland and the construction of history, to science, futurism and time. Morgan’s output was relentless, and he was equally as comfortable writing Spenserian sonnets and villanelles as he was with the most esoteric of form-free post-modernisms. ‘The Loch Ness Monster’s Song’ is a rhythmic exercise in gibberish/nonsense, whereas the sublime ‘Planet Wave’ is a suite of ten poems beginning with the big bang, and reaching bravely into the concepts of endlessness and legacy. My friends, do you want to know what you should feel? I can’t tell you, but feel you must. What is immediately striking about Morgan’s poetry is the momentum of the verse; his prosodic mastery is compounded by his sparse punctuation and the brevity of his assertions. Frequently, his poems consist of only a single sentence, occasionally split into commata, but very rarely anything heavier. The lack of end-stops carried by his lines lends great pace to his poetry, and I often find myself swept up into the verse, not pausing until I finish reading the poem. In fact, line-ends are frequently the only syntactic breaks in Morgan’s pieces; you’re carried into the restless, pulsing expression of the narrator’s inner-most conflicts, only given pause to consider the significance of his ideas at the very end. Such poetry was written to be read aloud – and I recommend that you hunt down some recordings of Edwin Morgan reading his own poetry. The low, heavily-accented timbre of his beautiful voice gives his poetry a forceful identity that it could never have in text alone. He made several recordings for the Glasgow Herald a couple of years ago – I’m sure they’re available on YouTube or elsewhere in the ether of the internet. His more recent recordings are his best; his experienced, measured delivery is of a kind that only comes with age: a melancholy without self-pity. One of his greatest achievements was to re-define what it means to be a Scottish writer. Throughout his career, Morgan constantly wrestled with the concept of ‘Scottishness’ in literature. He was aware of the weight of the past, but he was persistently rushing towards the future. There’s a tension between a romanticised and idealised artistic vision of Scotland (as might be expressed in, say, the works of Walter Scott) and a more modern, realistic image of Scotland as industrial and contemporary; a country with as much pain as beauty. It is in this conflict that Morgan discovered his most provocative and moving imagery; a country ancient and new; a landscape wild but calming. This conflict between how Scotland is seen, and what Scotland is, has become a major theme in modern Scottish literature, and it’s easy to detect the influence of Edwin Morgan in so many Scottish writers currently working: Iain Banks, Christopher Brookmyre, Ian Rankin, even Irvine Welsh. If you find yourself with a spare five minutes or five pounds, then I urge you to find some of Edwin Morgan’s poetry. There are many collected editions available, and his work is featured in most half-way decent anthologies of modern poetry. Do you think your security can keep you in purity? This entry was posted in Musings and tagged Edwin Morgan. Bookmark the permalink.